Description: CSXT Northbound Freight Train awaiting a fresh crew at Tarrant City, Al. Description: S400, lead by CSXT 4812, heads westbound on the eastbound tracks, past the CPL at the Maple Avenue crossing. 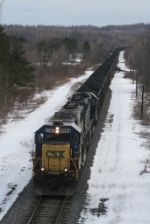 Description: CSX Q633 with a matched pair. Description: CSX K23619 has coke loads for Fort Drum as it heads north. Description: CSX K23619 has coke loads for Fort Drum as it passes block station Rice. Description: An HLCX unit leaded a short manifest up to the signal at Sandpatch as an autorack train passes on the right.